CODY, Second Lieutenant, SAMUEL FRANKLYN LESLIE, 41st Sqdn. Royal Flying Corps and General List. Killed in aerial combat 23rd January 1917. Age 21. CODY, Second Lieutenant, SAMUEL FRANKLYN LESLIE, 41st Sqdn. Royal Flying Corps and General List. Killed in aerial combat 23rd January 1917. Age 21. 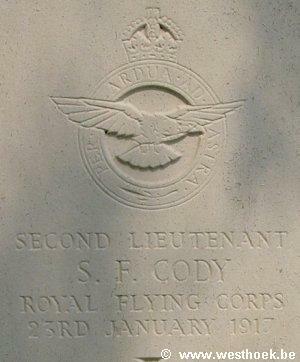 Son of Lela M. Cody, of Vale Croft, Ash Vale, Surrey and the late aircraft pioneer, Samuel F. Cody; husband of Maude H. Cody, of 'Notre Dame', Church Road, Aldershot, Surrey. XVI. C. 1. 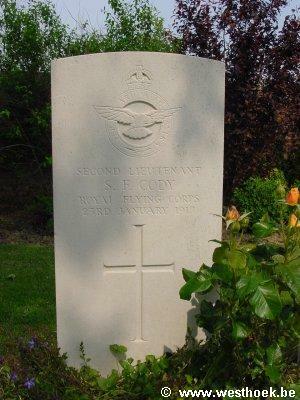 Samuel Cody werd tijdens een luchtgevecht gedood op 23 januari 1917. Hij was de zoon van luchtvaartpionier Samuel F. Cody. Hij ligt begraven op Perth Cemetery (China Wall) in Plot XVI Rij C Graf 1.